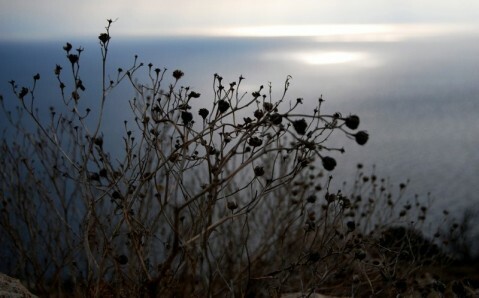 Cape Fiolent occupies a special place among Crimean beauties. 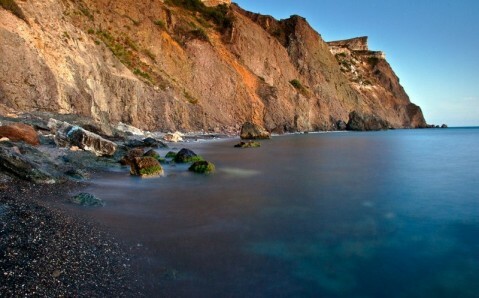 Its severe rocks that pile up over endless sea surface stretch for several kilometers from Sevastopol to Balaklava. 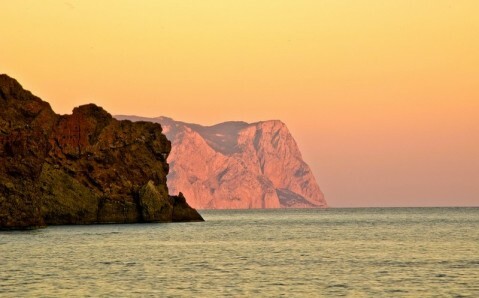 It is one of the most charming and inimitable corners on the Crimean peninsula that captures with beauty of wild nature and never-ending romance. Situated far from south-coastal resorts' noise and fuss, it is the best place for calm balanced recreation and admiration of splendid Crimean panoramas. 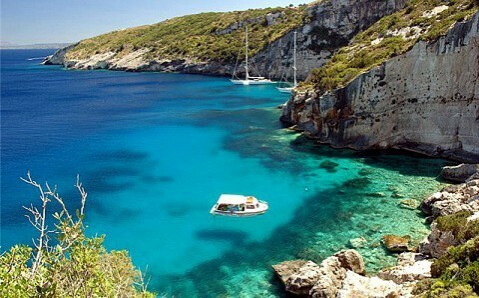 A charming landscape meets every traveler coming to Cape Fiolent: pointed rocks of peculiar shape that emerge from the sea abyss, azure bays' absolutely clean water, miniature islands and stone chaoses, excellent beaches that formed in coastal gorges. Fiolent has volcanic origin: it was formed due to ancient volcano's activity that functioned here over 150 million years ago. Lava flows and tuff layers are still seen in coastal steep astride the Cape. Impregnations of various minerals - jasper, chalcedony, cornelian and others - can be also spotted in the cape strata. In ancient times, this cape was called Partenium, meaning 'Virgo's Cape'. This name is connected with ancient Greek myth about Ifigenia, the daughter of Tsar Agamemnon. She was kidnapped by Goddess of hunting Artemis, who brought her on a cloud to Crimean peninsula's south in order to turn her into a priestess in Virgo's temple. 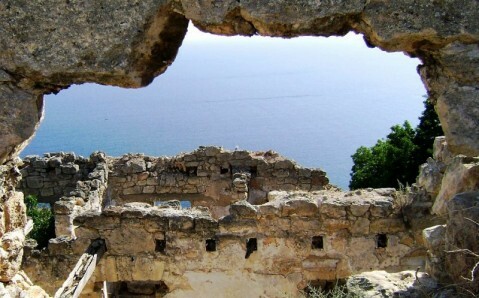 In the Middle Ages the cape was called St. George - after the St. George Monastery located here. According to legend, it was named Fiolent by the Genoese: 'violento' is Italian for 'turbulent, violent'. And considering frequent sea unrests near the cape, this name totally corresponds to reality. Besides vivid natural riches, Fiolent's most notable sight is St. George Monastery - one of the oldest in Crimea, standing at the very steep. As the legend has it, it was founded in 891 by Greek sailors. In the moment, when they passed the cape, storm began and the shipwreck started. Scared seamen started calling St. George for help - he appeared on the large rock near the shore and calmed the storm. After the miraculous rescue the sailors discovered an icon on the rock, brought it to the shore and founded a cave temple on the cliff. Later a monastic complex was formed around it. With its closure in the 20th century, the cloister was severely damaged. Today several monks live here and restore the monastery. 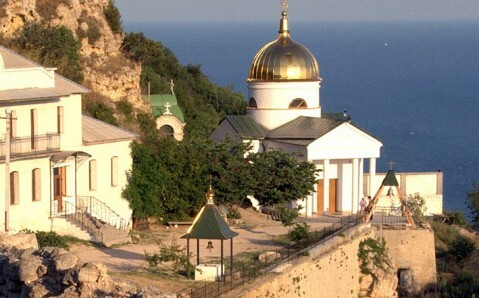 The highest in Crimea stone stairway descents to the sea from the St. George Monastery. It numbers 800 stairs and leads to the Cape Fiolent's most famous beach - Jasper, or also known as Monastic. Stretching for almost a kilometer, it is considered to be one of the cleanest and most picturesque beaches at the Southern Coast of Crimea: transparent water, golden sand, colorful pebble... And in addition, special micro climate, mixture of sea and mountain air makes Fiolent the best place not only for recreation, but also for health improvement. Right opposite to Jasper Beach, the Saint Appearance Rock juts out from the sea. It was here that ancient Greeks saw the sign of their rescue - St. George's icon. In honor of monastery's 1000th anniversary, the seven-meter high cross weighing almost 1,5 tons was installed there. Today it's one of the Cape Fiolent's most notorious symbols. Getting here. There are two ways to get here. 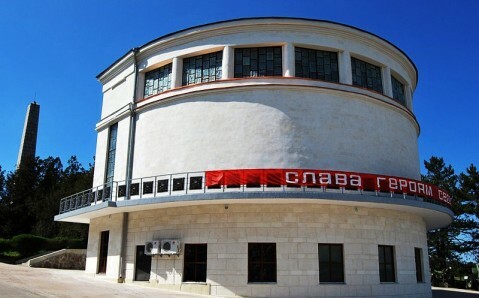 The first one is to take a route taxi № 107, 109 or 84 from Sevastopol's train or bus station to the bus stop 'Ploshad imeni 50-letia Oktyabrya', and then to take a bus № 2, 19 or 78 to the bus stop 'ST Fiolent - Tsarskoye selo'. The second way is to take a bus № 17 or 20 from Sevastopol's train or bus station to the road interchange 'the 5th km' and then to take the bus № 2 to the bus stop 'Fiolentovskoye Shosse'. Кристально чистая вода!! А горы..
Бывает очень ветрено, может сдуть :) Красиво. Насчитал 834 ступеньки. Как ни странно, подъем совсем неутомителен. Хотя, кому как! Очень красивые виды, завораживает. Высоко подниматься и тяжело спускаться,но это того стоит. Море чистейшее, но много людей. Ходят катера до Балаклавы. 800 ступенек, 928 шагов. Но чистое море того стоит! это одно из самых чистых и живописных мест в Крыму!!! Мыс сложен породами вулканического происхождения, остатками древнего вулкана, действовавшего здесь 150 млн лет назад. По обе стороны от мыса в береговом обрыве видны потоки лавы и пласты туфов. Замечательное место. Необыкновенный вид. Стоит посетить беседку и монастырь.